Christianity Today’s online magazine Parse recently posited that the rise of the automobile laid the groundwork for the modern megachurch. It’s a recommended read that gets to the crux of a problem in modern Christianity – a problem that cars only amplified: our self-centeredness. 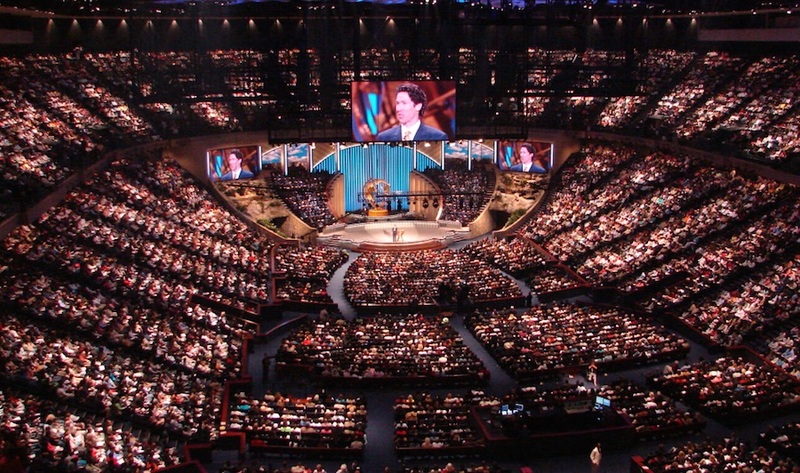 There are, of course, plenty of God-fearing Christians attending megachurches, but these churches commonly present a wide array of problematic practices. As the Parse piece details, these churches appeal to consumer-worshippers who are willing to drive to whichever church provides the most attractive platter of programs, comfort, and entertainment. The personal whims of the laity have become the primary shaper of the modern American church landscape. So churches pull out all the stops. They pile on program upon program, childcare, coffee shops, stadium seating, and a multitude of services at multiple times on various days, to accommodate all the truly important things we fill our schedules with. But all of this effort isn’t getting megachurches very far. Just because people are in the pews today doesn’t mean they’re here to stay. Ligonier and Lifeway Research just released a significant survey on the current views and attitudes of American Christians. Half of the 3000 respondents said they thought worshipping alone or with family is just as good as going to church. 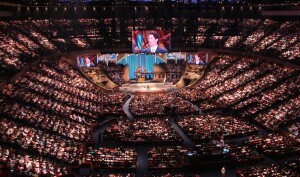 This is consistent with a survey the Willow Creek megachurch did of its own members. In it they found that 63% of those “exhibit[ing]all the signs of full devotion” said they sometimes consider leaving the church. No matter how tasty the platter, the exultation of personal preference destroys the commitment of the Christian to his fellow believers in the church. It’s hardly surprising that modern American Christians have largely abandoned our sense of duty and self-sacrifice when it comes to church. After all, we’ve been progressively ignoring our faith traditions for decades. The Ligonier survey found some disheartening (though not unexpected) responses. 45% of Americans believe there are many ways to heaven. 67% believe people are mostly good, and while 61% believe hell is a real place, most don’t seem to think many people will wind up there. Less than half of Americans believe the Bible is the Word of God, and only 43% say it is 100% accurate. The survey numbers confirm the trends we see throughout American culture. Americans don’t believe in the traditional Christian God; we don’t believe in the Bible; our own gut feelings trump what the Bible and Christian tradition say; and we believe most people are basically good and will go to heaven. Above all, we believe the greatest commandment is to be nice and the greatest sin is to offend someone else. Contrast this with the words of Jesus. When his disciples were concerned that he had offended the religious leaders of His day, Jesus responded, “Every plant which My heavenly Father has not planted will be uprooted. Let them alone. They are blind leaders of the blind. And if the blind leads the blind, both will fall into a ditch” (Matthew 15:13-14). Hardly the words of someone worried about offending others. Indeed the core of the Gospel is about as offensive as you can get: All people are wretched sinners deserving of eternal damnation. But the Gospel also presents us with the greatest hope for loving forgiveness: all sins can be forgiven through the sacrificial work of Christ. Perhaps success is the greatest enemy of the modern American Christian. We are comfortable, our basic needs are largely met, and we live in relative peace and security. Who wants to ruffle feathers by promoting hard truths or defending the Bible and Christian tradition in the face of the trends of the day? We have become ashamed of the Gospel as we grow accustomed to thinking of our achievements as the work of our own hands. We worry more about status and image than about the fate of souls. Self-centeredness is a root sin for all people, but it seems to be growing particularly well in the fertile heart of the modern American Christian. So what would a return to our strong Christian tradition look like? And what would it mean for the broader American culture? We would be more resistant to the trends and pressures of our culture. The “consensus” of the day is constantly changing, and we are far too willing to adapt our Christianity to the whims of culture. Holding to the words of the Bible and the traditions of 2000 years of Church history would do much to correct this pathetic “me too” sheepish pandering. We would believe in the real God. Too often God is removed from the day-to-day thoughts of the comfortable American Christian. He only enters into the picture in times of personal crisis, of which we have relatively few. He is viewed like Santa Claus with a one dimensional personality: unconditional love, no strings attached. The traditional Christian God of the Bible is so much greater and more majestic than this. He is a God to live for, to believe in, and to be transformed by. We would take our Bibles seriously, being transformed by our faith. We would show great love to our neighbor, great self-sacrifice, and a shocking reordering of priorities. We would fellowship with believers, help the poor, witness to others. We would take the Sabbath seriously, pray continually, and demonstrate humility. If the number of Americans who profess to be Christians today started living consistently with Scripture, our culture would be transformed overnight. Sadly, the most we ever hear about Christian action today is a media report on the latest social justice movement. Some of these movements are worthwhile, but far too many are labels under which Christians are simply recommending more government action, in lieu of actually living out their own personal duty to love their neighbor. In truth, traditional biblical Christianity presents the best hope for a good life on earth: Love the Lord your God and your neighbor as yourself. These two great commandments have transformed humanity for millennia – they’re still relevant today. If more modern American Christians would act as actual Christians, the cultivation of our culture would be beautiful to watch. The research questions – when I looked at them when Ligonier first published them last week – assumed Monergism/Calvinism as the normative Christian position, and so Calvinists would come out as ‘more Christian’ than a Synergist/Arminian answering the same questions. But that they still get such dismal results, makes it even more telling. One of our key ‘New Evangelists’, here in England, and I, parted ways when she started quoting Rick Warren and Bill Hybels, and getting cozy with the Church of Nicky Gumbel, the founder of the Alpha Course, and promoter of the ‘Toronto Blessing’. It seems to me that what’s happening with her is that she’s conflating ‘The Purpose Driven Life’ with ‘Intentional Discipleship’, and I think she’s not the only one. Needless to say, it seems to me she’s also smitten more with the numbers game and Church Growth (‘Schullerism’), than the health of the vine: quantity rather than quantity. Ironically, Michael Horton of Ligonier, as well as people like RC Sproul and Kevin DeYoung, are more concerned about ‘catholicity’ than the New Evangelists I know who are supposed/claim to be so. Horton even bemoans in one of his interviews on a radio show on the White Horse Inn, or somewhere, the fact that Evangelicalism has lost its sense of their being no salvation outside the Church! Ordinary: Sustainable Faith in a Radical, Restless World. The deeper problem of coarse is ‘en sola scriptura’ or ‘the bible alone’ most christian denominations in the united states ascribe to it. The logical reality is however, that if they only arbitrator of faith is me myself and I and no one has any greater authority to interpret the scripture then I do, then my religion is the one I make it to be. The final logical conclusion of that philosopy is that there is no such thing as truth also, no such thing as God. It leads to a practical kind of atheism couched in personal spirituality.